Here at Hotel Zero Degrees, we pride ourselves on providing some of the best-appointed and most versatile event spaces in Fairfield County, Connecticut. Whether a meeting, a corporate retreat, or a private party, turn to us—and our exceptional catering partners, Z Hospitality Group—for the perfect venue. With a New Year upon us, we thought we’d take the opportunity to survey some of the meeting and event trends experts have identified for 2019. In today’s blogpost, we’ll be tapping a couple of sources: Event Manager Blog’s (EventMB) “Top 100 Trends for 2019” and a roundup by Barbara Scofidio over at Prevue magazine. We encourage you to check out both, but in the meantime, we’ll pull out a few highlights from each! Both EventMB and Prevue emphasize how more and more event organizers are incorporating wellness into the itinerary: mindfulness breaks, mental-health sessions, creativity stations, and more. EventMB points out that today’s technology offers myriad new possibilities for involving remote attendees in your happenings. From virtual reality to live YouTube commentaries, consider ramping up the interactivity and immersion of your event for online participants. Speaking of tech, Scofidio’s Prevue article suggests augmented reality is rapidly becoming a go-to tool for event managers: facial recognition software, hologram interactions, and a whole brave-new-world’s worth more. A well-structured layout and schedule can hugely boost the efficiency and productivity of your meeting or conference. Encourage networking, for example, by setting up “different table lengths and sizes to create an intimate space and also seat your attendees comfortably,” EventMB suggests, and consider adding roundtable discussions to the proceedings. The concept of structuring an event around a theme has moved well beyond the realm of parties to include meetings and conferences, as EventMB notes. Use your creativity and consider how a thoughtfully chosen theme might inform some productive activities. 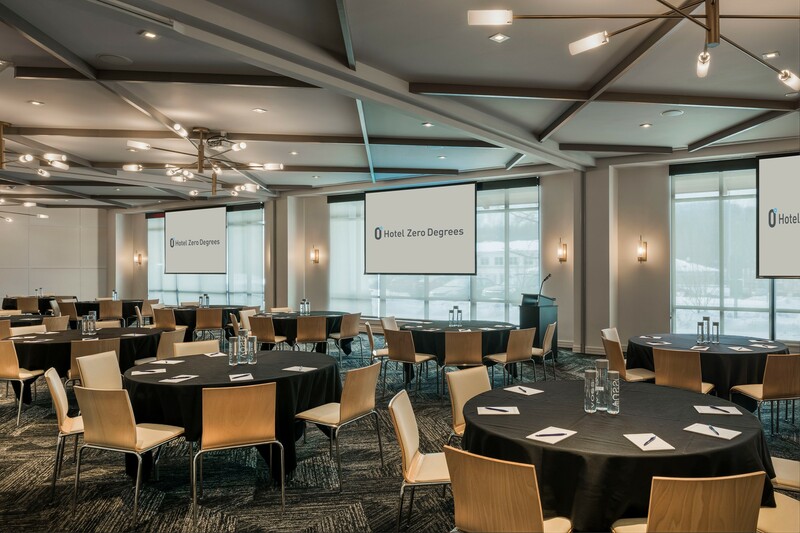 With the above trends (and the others EventMB and Prevue explore) in mind, book your 2019 business meeting or other event at Hotel Zero Degrees today! Simply fill out our Request for Proposal form and we’ll be in touch directly.